It may have helped Gonzales that the Mariners had a lead for those final three innings. Fiers was pulled after a disastrous five-run third inning in which the Mariners showed off their power both at the plate and on the bases. Dee Gordon scored Seattle’s first run with a single, then stole second, and showed his intent to steal third. Fiers loaded the bases on a walk and a hit-by-pitch, and then watched Domingo Santana hit the season’s first grand slam. It was far from the outing anyone expected, but Fiers was not responsible for serving up the pitch that led to the season’s first bat flip. That honor belongs to A’s reliever Ryan Dull, who sent Tim Beckham a pitch that he yanked into the stratosphere — with a glorious bat twirl to match. That home run capped off a three-run fifth for the Mariners, giving them a 9-4 lead. The A’s made a valiant attempt at a comeback on a three-run home run from Matt Chapman in the seventh, but they couldn’t close the two-run gap before the final out of the ninth. 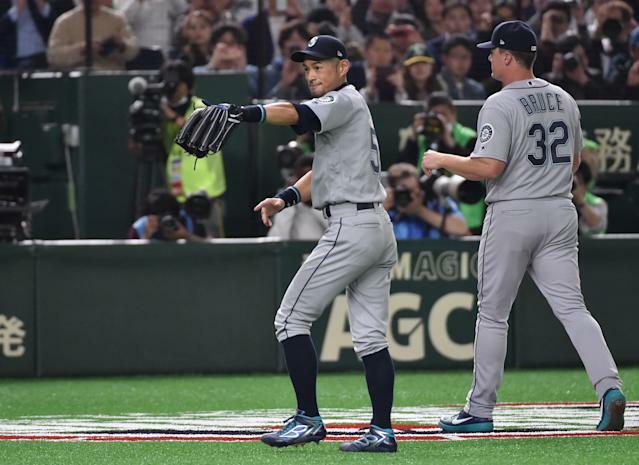 Despite the home runs and bat flips and the beginning of the 2019 season, all the focus was on Ichiro Suzuki. The 45-year-old was introduced to a thunderous ovation from the euphoric crowd. The crowd went even crazier when he exited the game before the bottom of the fourth inning. That’s not it for Ichiro and his illustrious career. He’s expected to start Thursday’s game (and even drew a walk in the fourth inning on Wednesday). But after that, no one knows. It’s possible that the innings he plays on Thursday could be his last. If that’s true, we know he’ll play every minute to its fullest, and it’s the fans’ job to enjoy every second of Ichiro we have left.